My LaCie Electron22Blue4 is starting to drift rather rapidly, colorwise. Has anybody ever dug into their LaCie to tweak the pots? I've never done this and haven't been able to find a manual. Would appreciate any tips you might have. The .jpg shows the latest calibration plots. As you can see the relation between green and red+blue is very non-linear, and this discrepancy has been increasing over the last several calibrations. Green has always been a little away from the other curves, but it's been getting increasingly worse. Also I can't get 100cd/m2 luminance any more as I could previously. Looks to me like the drive (or gain, or whatever...) on the green is wrong, probably it's set too high. Or maybe R & G are too low, dunno. I just hope this is not the Beginning of The End for my wonderful old monitor. Having just calibrated it the color is now truly gorgeous but I know that will be short lived. Use the trending feature in this software to see if this really is the case, not the curves shown here. 100cd/m2 is pretty high even for a new CRT. 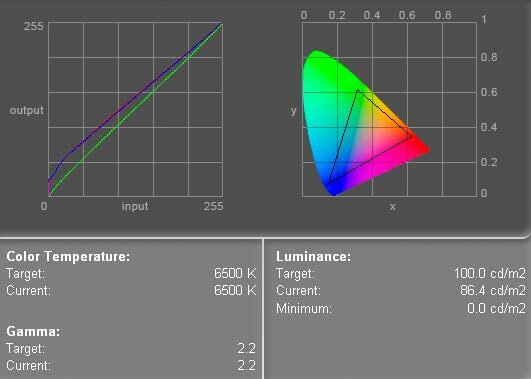 If you can't hit that target, well you'll have to lower the target calibration luminance. The brighter you have it the faster it wears out. Check your ambient light level and make sure it isn't too bright and use the recommended nits or cd/m2 levels. Using anything above 90 will be overly bright in a properly lit/darkened room, giving you a poorer match between paper and CRT in the midtones as it fools your brain too holding back intensity in PS. I find I get too dark midtones when using a out of the box cinema display 23" which is insanely bright - best suited to video/motionfilm use in my opinion. The DigitalDog who commented on your post might have some corrections on the above as I belong to the mortals in the colormanagement world.